While the Palestinian people suffer under continued political division and its impact on their daily lives, the wedge between Fatah and Hamas has grown amid a raging media war. This is a clear indicator at the start of the new year that reconciliation is not possible, at least in the near future. Reconciling adversaries in the West Bank and Gaza Strip has become very difficult due to intransigence on both sides and finger pointing about who is to blame for the rift. This has dashed all hopes that the new year will be one that sees Palestinian unity in confronting a most serious and possibly existential threat facing the Palestinian cause and people. Reham Ouda, a Palestinian political analyst, believes the general outlook according to statements by President Mahmoud Abbas is to directly punish Hamas, while not punishing the Palestinians in Gaza. Citizens will be all but screened to differentiate between normal civilians and those associated with Hamas, whose salaries will be suspended. There are reports that the Palestinian Authority (PA) and Fatah will pay overdue salaries to civil servants in the next few months and dismiss others based on their affiliations after they began following Mohamed Dahlan’s camp. 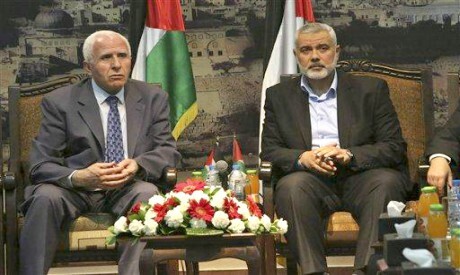 Ouda continued that dissolving parliament triggered new steps; new parliamentary elections could take place in the West Bank only since they cannot be held in Gaza, which means a semi-separation between the West Bank and Gaza. She also noted the PA could declare Gaza a “rebel territory”, but this requires Arab and international support for such a serious step. “I don’t believe President Abbas would take such a decision, at least not anytime soon,” Ouda stated. Such a declaration would mean a political siege on Hamas’s foreign relations and banning any international agencies, institutions or countries from dealing with Gaza and the de facto government there because it is illegitimate. Hamas or the government in Gaza would also lose all international and local representation. Opening bank accounts, money transfers and taxes would also be suspended and PA would impose sanctions. This would also impact the freedom of movement, in travel permits from Gaza to the West Bank and vice versa. “Declaring the Gaza Strip a rebel territory has serious economic and political repercussions,” Ouda said. Ouda continued that from a legal standpoint the PA is the legitimate power in front of the world. It goes to the UN and gathers votes in support of the Palestinian cause; therefore, it is capable of enforcing such a decision. But Ouda does not expect such steps would cause Hamas to surrender or change its course. Loathsome division would continue indefinitely, especially since Hamas receives financial support from Iran and Qatar. Therefore, despite the financial strain, it can manage the situation and continue operating. Ouda noted that Hamas’s claims that it was able to remove former Israeli defense minister Avigdor Lieberman from office are not true. She believes Hamas’s impact is limited and short lived, unlike the PA, which has an impact on the international stage and has succeeded diplomatically through the use of international law. “We cannot say Hamas won, even if Lieberman resigned,” she said. Ouda believes major confrontations — even if many years down the road — will take place between the occupation army and Hamas. This is what will decide whether Hamas is victorious or not. However, such confrontations are on the back burner until Israel resolves the threats on its northern border, the issue of Iran and preoccupation with Syria. Adnan Abu Amer, an expert on Israeli affairs, said it is clear that Abbas is moving quickly towards separating the West Bank and Gaza. Even if he does not announce it directly, his steps imply this. Abu Amer believes separation will happen and Palestinian brethren in the West Bank and Gaza will be torn apart and segregated. He continued that even though Abbas denies participating in the US-spawned “deal of the century” and publicly rejects it, his actions on the ground show he is implementing it either through the issue of salaries or suspending funds to Gaza. “All these hasten the steps towards separation,” he said. Abu Amer noted that the message the leadership in the West Bank is propagating, that salaries will be dispensed depending on the party affiliation of civil servants (meaning only to Fatah loyalists), is unpatriotic since civil servants should get paid irrespective of their politics. He believes this is to put pressure on Hamas to force Palestinians in the Gaza Strip to protest against Hamas and trigger an uprising for its overthrow, which is nonetheless unlikely. Ibrahim Deebes, a writer, believes the fracture is now becoming a permanent condition and if it wasn’t for the geographic distance between the West Bank and Gaza there would have been armed clashes and sectarian war. “All conciliation efforts by Egypt have failed,” said Deebes. He warned that the cancer of occupation continues to expand and the threat of complete Judaicisation is increasing, and division accomplishes the next goals of occupation. “They want Gaza to be the centre of what we call a state, and for West Bank residents to join them so [Israel] can capture the land and remove the people,” said Deebes. He added that upcoming elections in Israel will usher in a more radical right-wing government and the worst is yet to come. Abbas’s recent confrontational steps began with the decision to dissolve parliament, followed by the removal of PA-loyal staff from Rafah border crossing, and threatening to suspend the budget of the Gaza Strip, estimated at $96 million. The situation will likely continue to escalate and deteriorate. Meanwhile, Hamas prevented Fatah supporters from celebrating the anniversary of the group’s creation and igniting a torch in Unknown Soldier Square in the centre of Gaza. This was preceded and followed by extensive arrests and interrogations of leading Fatah members. Tensions boiled over after the PA’s radio and television building at Tal Al-Hawa in Gaza was raided and its contents destroyed. Hamas’s Interior Ministry said it has identified the culprits, but many international agencies and institutions blame Hamas because it is in charge of security in Gaza.